The inertial navigation system provides information similar to that supplied by a doppler system, and it also gives readings of latitude and longitude when desired. The inertial system utilizes extremely sensitive gyros and accelerometers to develop signals from which navigation information is computed. inertial measurement unit (IMU), the system power supply, and the battery charger. The IMU is manufactured by the Kearfott Systems Division of Singer- General Precision, Incorporated. This unit contains a stabilized platform on which are mounted two 2 degrees-of-freedom gyros, a two axis accelerometer, and 401 a single-axis accelerometer. The stable platform is isolated from angular motions in the aircraft by a shock-mounted gimbal system providing isolation from aircraft vibration. The IMU is contained within a fixed outer frame which serves to mount the platform, the IMU connectors, and the electronics for instrument compensation and electrical adjustments. Aircraft pitch, roll, and heading data is provided by synchros mounted on the platform-gimbal axis. The gyros in the IMU sense pitch, roll, and yaw and produce signals which are converted to usable information by the computer. Acceleration in any direction is sensed by the accelerometers, and this information is also employed by the computer to provide navigation information. The information developed by the computer is displayed on the control/ display panel. The following information is available: track angle and ground speed, true heading and drift angle, crosstrack distance and trackangle error, present position in latitude and longitude, latitude and longitude of any of the nine way points stored in the system, wind speed and direction, distance and time to the next way point, desired track, from or to a way point, way-point alert, system-failure warning, battery mode of operation annunciation, and attitude reference-mode annunciation. Desired information is displayed when the selector switch on the control/display panel is rotated to the appropriate position. When an impurity like arsenic is added to germanium it will change the germanium crystal lattice in such a way as to leave one electron relatively free in the crystal structure. Because this type of material conducts by electron movement, it is called a negative carrier (N-type) semiconductor. Pure germanium may be converted into an N-type semiconductor by doping it with a donor impurity consisting of any element containing five electrons in its outer shell. The amount of the impurity added is very small. An impurity element can also be added to pure germanium to dope the material so as to leave one electron lacking in the crystal lattice, thereby creating a hole in the lattice. Because this semiconductor material conducts by the movement of holes which are positive charges, it is called a positive carrier (P-type) semiconductor. When an electron fills a hole, the hole appears to move to the spot previously occupied by the electron. As stated previously, both holes and electrons are involved in conduction. In N-type material the electrons are the majority carriers and holes are the minority carriers. In P-type material the holes are the majority carriers and the electrons are the minority carriers. Conduction in this type of semiconductor is similar to conduction in a copper conductor. That is, an application of voltage across the material will cause the loosely bound electron to be released from the impurity atom and move toward the positive potential point. In current flow through a P-type material, conduction in this material is by positive carrier (holes) from the positive to the negative terminal. Electrons from the negative terminal cancel holes in the vicinity of the terminal, while, at the positive terminal, electrons are being removed from the crystal lattice, thus creating new holes. The new holes then move toward the negative terminal (the electrons shifting to the positive terminal) and are canceled by more electrons emitted into the material from the negative terminal. This process continues as a steady stream of holes (hole current) move toward the negative terminal. In order to provide a pilot with an indication of his distance from the runway, marker-beacon transmitters are installed with the outer-marker transmitter at approximately 5 miles from the runway and the mid-marker approximately 5 mile from the end of the runway. The marker-beacon transmitter operates at a frequency of 75 MHz and produces both aural and visual signals. The outer-marker transmitter produces a 400-Hz intermittent signal which causes a blue indicator light on the instrument panel to glow intermittently. The midmarker transmitter produces a signal modulated at 1,300 Hz which causes the amber marker-beacon light on the instrument panel to glow. Thus, when the airplane is approaching the runway and is approximately 5 miles from its end, the blue light will flash. A short time later, when the airplane is within 2/3 mile of the runway, the amber light will flash. This system provides an excellent indication to the pilot of his distance from the runway. The marker-beacon receiver for a typical large aircraft navigation system is a crystal-controlled fixed frequency superheterodyne designed to operate only on a frequency of 75 MHz. The receiver is equipped with output circuits which enable it to deliver both aural and visual signals to the flight crew. A portion of the output signal is fed through a transformer to audio filters tuned to 400, 1,300, and 3,000 Hz. The 75 MHz - signal from the marker-beacon transmitters is modulated with the three different audio tones, depending upon whether the transmitter is a midmarker, an outer marker, or an airways Z, or fan, marker. Each of the audio filters is designed to select one of the frequencies and with this signal activate a switching circuit which causes the appropriate signal light on the instrument panel to flash. The indicator lights are white, amber, and blue, thus making it possible for the pilot to know what type of marker he is passing over. For example, if the blue light flashes, the pilot will know that he is passing over the outer marker. Java is uniquely suited for network programming. It provides solutions to many issues that are difficult to solve using other programming languages. Java applets have a higher level of safety than that of similar software packages. Java is portable and platform-independent; Web applications are designed on various hardware and operating environments. Java executes applications in a run-time environment called a virtual machine. The virtual machine executes the platform-independent bytecode that a Java compiler generates and is easily incorporated into Web browsers or the kernel of the operating system. Java virtual machines and Java API’s (application program interfaces) insulate Java programs from hardware dependencies; this is why Java’s bytecode can run on a wide range of platforms. Java applications can run on a variety of platforms without modification. Java is also used for database programming. SQLJ is a way to embed the SQL (structured query language) in Java programs and to reduce the development and maintenance costs of Java programs that require database connectivity. SQLJ provides a simple model for Java code containing SQL statements. SQLJ offers a much simpler and more productive programming API’s than JDBC (Java database connectivity) to develop applications that access relational data, and it can communicate with multi-vendor databases using standard JDBC drivers. Distributed databases provide a mechanism for the information exchange in distributed processing. A distributed database is different from a centralized database as the latter provides data on one machine. A distributed database is composed of separate databases distributed on a computer network that are accessed by all permitted users. Information exchange may also occur among databases; in other words, a computer in the distributed database can access the data stored in other computers. Data consistency is guaranteed by intrinsic properties of databases. One advantage of a distributed database is that local databases are used to store the local information in the system. Compared with a centralized database, a distributed database can save capital investments in communication networks with a higher security and reliability, since it can restrict local faults within the corresponding subareas. A homing guidance system requires that a missile contain such electronic sensing and control devices that the missile will seek a target on its own without the need for command signals from outside the missile. Homing systems are classified as active, semiactive, and passive, depending upon the nature of the sensing and controlling mechanisms. An active homing system generates and transmits a signal which is sent to the target and reflected back to the missile from the target. The guidance system utilizes this reflected signal as a beam to guide the missile to the target; it is common practice to employ a radar signal for this purpose. In a semiactive homing system the target is "illuminated" by a signal from a source outside the missile. The illuminating signal may be transmitted from a ground station or a mother ship in flight. In any case, the missile system receives a reflected signal from the target and rides the reflected signal to the target. The passive homing system employs some form of energy radiation from the target to serve as a beam for guidance; the energy may be in the form of heat, light, or sound. Among the most effective homing systems for guided missiles is the infrared sensing system used on many airborne missiles. The infrared homing system is passive, because the energy for guidance of the missile is supplied by the target. The missile guidance system uses this energy to provide the directional signals needed to home on the target. The heat from the exhausts of a flying aircraft provides an excellent form of radiated energy which is easily detected by an infrared sensor not too distant from the source. waves; it lies in the frequency range between the two. The full range of wavelengths for infrared radiation is 0.7 to 30 microns (1 micron is one-millionth of a meter), and the range employed for infrared homing is about 1.5 to 6 microns. This is a frequency range of 200 to 50 million MHz, which may also be expressed 2 x 10' to 5 x 10' MHz. The principal device in an infrared detector is usually a parabolic mirror which collects the infrared radiation and focuses it upon a heat-sensitive device such as a thermopile or bolometer. A thermopile consists of a group of thermocouples connected in series to increase the total voltage output, which is then amplified and used to actuate the control system of the missile. In order to provide a directional reference, the mirror which picks up the infrared radiation must be rotated eccentrically to produce a conical scan. If the signal is equal throughout a complete rotation of the mirror, the target must be centered in the scan area. If the target is not centered, there will be a stronger signal on one side of the scanned circle than the other. This signal will be employed in the missile computer to indicate the position of the target with respect to the missile heading and will also cause guidance commands to be sent to the missile autopilot. A buffer is the application address space that references the data to be sent or received. In most cases, this is simply the variable name that is to be sentheceived. For C programs this argument is passed by the reference and usually must be pre-pended with an ampersand. A data count indicates the number of data elements of a particular type to be sent or received. A data type must use the data types predefined by MPI, though programmers can also create their derived types. We should note that the MPI types, MPI-BYTE, and MPIPACKED do not correspond to standard C or Fortran types. A dest indicates the send process where a message should be delivered, it is specified as the rank of the receiving process. A source indicates the originating process of the message; as the counterpart of the dest, it also specifies the rank of the sending process. The source may be set to the wild card MPI-ANY-SOURCE to receive a message from any task. The tag is an arbitrary non-negative integer assigned by the programmer to uniquely identify a message. The send and receive operations should match message tags. For a receive operation, the wild card MPIANYTAG can be used to receive any message regardless of its tag. The MPI standard guarantees that integers 0-32767 can be used as tags, but most implementations allow much wider range than this. A comm represents the designated communicator and indicates the communication context, or the set of processes for which the source or destination fields are valid. The predefined communicator MPI-COMM-WORLD is usually used, unless a programmer is explicitly creating new communicators. A status indicates the source of the message and the tag of the message for a receive operation. In C, this argument is a pointer to a predefined structure MPI-Status. In Fortran, it is an integer array of size MPI STATUS SIZE. Additionally the actual number of bytes received is obtainable fromstatus via the MPI-GET-COUNT routine. A request is used by non-blocking send and receive operations. Since nonblocking operations may return before the requested system buffer space is obtained, the system issues a unique request number. The programmer uses this system assigned handle later to determine completion of the nonblocking operation. In C, this argument is a pointer to a predefined structure MPI-Request. In Fortran, it is an integer. In the following, we present an example of point-to-point communication. Suppose that in the distributed load flow computation, SACCi and SACCj will exchange boundary state variables. For simplicity but without losing generality, we assume that SACCi will only send the magnitude of one boundary voltage variable. BCD counters are used when the application involves the counting of pulses and the result of counting is to be displayed in decimal. A single-stage BCD counter counts from 0000 (decimal equivalent ‘0’) to 1001 (decimal equivalent ‘9’) and thus is capable of counting up to a maximum of nine pulses. The output in a BCD counter is in binary coded decimal (BCD) form. The BCD output needs to be decoded appropriately before it can be displayed. Decoding a counter has been discussed in the previous section. Coming back to the question of counting pulses, more than one BCD counter stage needs to be used in a cascade arrangement in order to be able to count up to a larger number of pulses. The number of BCD counter stages to be used equals the number of decimal digits in the maximum number of pulses we want to count up to. With a maximum count of 9999 or 3843, both would require a four-stage BCD counter arrangement with each stage representing one decimal digit. Figure 11.21 shows a cascade arrangement of four BCD counter stages. The arrangement works as follows. Initially, all four counters are in the all 0s state. The counter representing the decimal digit of 1’s place is clocked by the pulsed signal that needs to be counted. The successive flip-flops are clocked by the MSB of the immediately previous counter stage. The first nine pulses take 1’s place counter to 1001. The tenth pulse resets it to 0000, and ‘1’ to ‘0’ transition at the MSB of 1’s place counter clocks 10’s place counter. 10’s place counter gets clocked on every tenth input clock pulse. On the hundredth clock pulse, the MSB of 10’s counter makes a ‘1’ to ‘0’ transition which clocks 100’s place counter. This counter gets clocked on every successive hundredth input clock pulse. On the thousandth input clock pulse, the MSB of 100’s counter makes ‘l’ to ‘0’ transition for the first time and clocks 1000’s place counter. This counter is clocked thereafter on every successive thousandth input clock pulse. With this background, we can always tell the output state of the cascade arrangement. For example, immediately after the 7364th input clock pulse, the state of 1000’s, 100’s, 10’s and 1’s BCD counters would respectively be 0111, 0011, 0110 and 0100. The excitation table is similar to the characteristic table that we discussed on flip-flops. 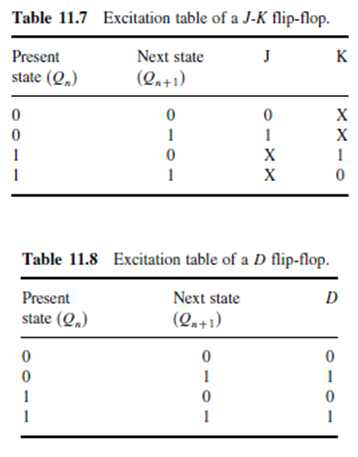 The excitation table lists the present state, the desired next state and the flip-flop inputs (J, K, D, etc.) required to achieve that. The same for a J-K flip-flop and a D flip-flop are shown in Tables 11.7 and 11.8 respectively. Referring to Table 11.7, if the output is in the logic ‘0’ state and it is desired that it goes to the logic ‘1’ state on occurrence of the clock pulse, the J input must be in the logic ‘1’ state and the K input can be either in the logic ‘0’ or logic ‘1’ state. This is true as, for a ‘0’ to ‘1’ transition, there are two possible input conditions that can achieve this. These are J = 1, K = 0 (SET mode) and J = K = 1 (toggle mode), which further leads to J = 1# K = X (either 0 or 1). The other entries of the excitation table can be explained on similar lines. In the case of a D flip-flop, the D input is the same as the logic status of the desired next state. This is true as, in the case of a D flip-flop, the D input is transferred to the output on the occurrence of the clock pulse, irrespective of the present logic status of the Q output. So far we have discussed different types of synchronous and asynchronous counters. A large variety of synchronous and asynchronous counters are available in IC form, and some of these have been mentioned and discussed in the previous sections. The counters discussed hitherto count in either the normal binary sequence with a modulus of 2N or with slightly altered binary sequences where one or more of the states are skipped. The latter type of counter has a modulus of less than 2N , N being the number of flip-flops used. Nevertheless, even these counters have a sequence that is either upwards or downwards and not arbitrary. There are applications where a counter is required to follow a sequence that is arbitrary and not binary. As an example, an MOD-10 counter may be required to follow the sequence 0000, 0010, 0101, 0001, 0111, 0011, 0100, 1010, 1000, 1111, 0000, 0010 and so on. In such cases, the simple and seemingly obvious feedback arrangement with a single NAND gate discussed in the earlier sections of this chapter for designing counters with a modulus of less than 2N cannot be used. There are several techniques for designing counters that follow a given arbitrary sequence. In the present section, we will discuss in detail a commonly used technique for designing synchronous counters using J-K flip-flops or D flip-flops. The design of the counters basically involves designing a suitable combinational logic circuit that takes its inputs from the normal and complemented outputs of the flip-flops used and decodes the different states of the counter to generate the correct logic states for the inputs of the flip-flops such as J, K, D, etc. But before we illustrate the design procedure with the help of an example, we will explain what we mean by the excitation table of a flip-flop and the state transition diagram of a counter. An excitation table in fact can be drawn for any sequential logic circuit, but, once we understand what it is in the case of a flip-flop, which is the basic building block of sequential logic, it would be much easier for us to draw the same for more complex sequential circuits such as counters, etc. Hard disks are nonvolatile random access secondary data storage devices, i.e. the desired data item can be accessed directly without actually going through or referring to other data items. They store the data on the magnetic surface of hard disk platters. Platters are made of aluminium alloy or a mixture of glass and ceramic covered with a magnetic coating. 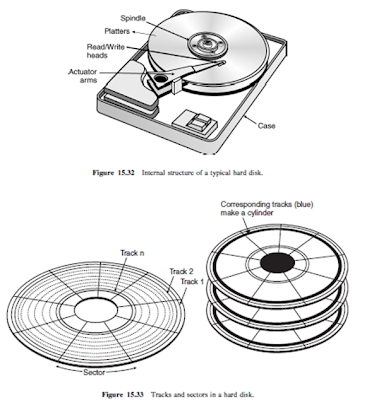 Figure 15.32 shows the internal structure of a typical hard disk. As can be seen from the figure, there are a few (two or more) platters stacked on top of each other on a common shaft. The shaft rotates these platters at speeds of several thousand rpm. Each platter is organized into tracks and sectors (Fig. 15.33), both having a physical address used by the operating system to look for the stored data. Tracks are concentric circles used to store data. Each track is further subdivided into sectors so that the total numbers of sectors per side of the magnetic disk are the product of the number of tracks per side and the number of sectors per track. And if it is a double-sided disk, the total number of sectors gets further multiplied by 2. From known values of the total number of sectors and the number of bytes stored per sector, the storage capacity of the disk in bytes can then be computed. There is a read/write head on one or both sides of the disk, depending upon whether it is a single sided or a double-sided disk. The head does not physically touch the disk surface; it floats over the surface and is close enough to detect the magnetized data. The direction or polarization of the magnetic domains on the disk surface is controlled by the direction of the magnetic field produced by the write head according to the direction of the current pulse in the winding. This magnetizes a small spot on the disk surface in the direction of the magnetic field. A magnetized spot of one polarity represents a binary ‘1’, and that of the other polarity represents a binary ‘0’. One of the most important parameters defining the performance of the hard disk is the size of the disk. Disks are available in various sizes ranging from 20 GB to as large as 80 GB. Other parameters defining the hard disk performance include seek time and latency time. Seek time is defined as the average time required by the read/write head to move to the desired track. Latency time is defined as the time taken by the desired sector to spin under the head once the head is positioned over the desired track. Input/output ports are used to connect the computer to external devices. Input and output standards described in the previous sections are referred to as external bus standards. In addition to these external buses, computers also have internal buses that carry address, data and control signals between the CPU, cache memory, SRAM, DRAM, disk drives, expansion slots and other internal devices. Internal buses are of three types, namely the local bus, the PCI bus and the ISA bus. This bus connects the microprocessor to the cache memory, main memory, coprocessor and PCI bus controller. It includes the data bus, the address bus and the control bus. It is also referred to as the primary bus. This bus has high throughput rates, which is not possible with buses using expansion slots. The peripheral control interconnect (PCI) bus is used for interfacing the microprocessor with external devices such as hard disks, sound cards, etc., via expansion slots. It has a VESA local bus as the standard expansion bus. Variants of the PCI bus include PCI 2.2, PCI 2.3, PCI 3.0, PCI-X, PCI-X 2.0, Mini PCI, Cardbus, Compact PCI and PC/104-Plus. The PCI bus will be superseded by the PCI Express bus. PCI originally had 32 bits and operated at 33 MHz. Various variants have different bits and data transfer rates. The industry-standard architecture (ISA) bus is a computer standard bus for IBM-compatible computers. It is available in eight-bit and 16-bit versions. The VESA local bus was designed to solve the bandwidth problem of the ISA bus. It worked alongside the ISA bus where it acted as a high-speed conduit for memory-mapped I/O and DMA, while the ISA bus handled interrupts and port-mapped I/O. Both these buses have been replaced by the PCI bus. The superheterodyne uses one or more mixers to convert an incoming signal, regardless of its frequency, to an identically modulated signal at some other, constant frequency. The signal frequency can be heterodyned once, twice, or even three times. Thus, you might hear of a single-conversion, double-conversion, or triple-conversion superheterodyne receiver. The incoming signal first passes through a sensitive, low-noise, tunable front-end amplifier. The tuning range of this amplifier must be sufficient to cover all the desired reception frequencies fIN. The second stage is a mixer/LO combination. The LO has a variable frequency that tunes over the received-signal range plus 9.000 MHz. The LO frequency control is the main tuning control for the entire receiver. The LO tuning might track along with the tuning of the front end, or the front end might tune independently by means of a separate preselector control. The mixer output is always at 9.000 MHz, no matter what the incoming signal frequency. The 9.000-MHz mixer output signal is called the intermediate frequency (IF) of the superhet. This signal has the same modulation waveform, and the same bandwidth, as the incoming signal. The only difference is that it might be “upside down”; LSB would be changed to USB, or the sense of FSK would be reversed. But this is an inconsequential difference insofar as it has no effect on the quality of the received signal. The IF is easy to process because its frequency never changes. Several IF amplifier stages, along with filtering, provide the best possible sensitivity and selectivity. This part of the receiver is the IF amplifier chain or IF chain. Down conversion is often used to allow reception of ultra-high-frequency (UHF) and microwave signals (above 300 MHz). The UHF or microwave input is mixed with an LO to provide an output that falls within the tuning range of a shortwave VHF receiver. A block diagram of a down converter for UHF/microwave reception is shown in Fig. 27-11B. At B, a down converter that allows UHF/microwave reception on a shortwave receiver. This converter has an output that covers a huge band of frequencies. In fact, a single frequency allocation at UHF or microwave might be larger than the entire frequency range of a shortwave receiver. An example is a UHF converter designed to cover 1.000 GHz to 1.100 GHz. This is a span of 100 MHz, more than three times the whole range of a shortwave radio. To receive 1.000 to 1.100 GHz using a down converter and a shortwave receiver, the LO frequency must be switchable. Suppose you have a communications receiver that tunes in 1-MHz bands. You might choose one of these bands, say 7.000 to 8.000 MHz and use a keypad to choose LO frequencies from 0.993 GHz to 1.092 GHz. This will produce a difference-frequency output at 7.000 to 8.000 MHz for 100 segments, each 1 MHz wide, in the desired band of reception. If you want to hear the segment 1.023 to 1.024 GHz, you set the LO at 1.016 MHz. This produces an output range from 1023 − 1016 = 7 MHz to 1024 − 1016 = 8 MHz. Grid Computing harnesses distributed resources from various institutions (resource providers), to meet the demands of clients consuming them. Resources from different providers are likely to be diverse and heterogeneous in their functions (computing, storage, software, etc. ), hardware architectures (Intel x86, IBM PowerPC, etc. ), and usage policies set by owning institutions. Developed under the umbrella of Grid Computing, information services, name services, and resource brokering services are important technologies responsible for the aggregation of resource information and availability, selection of resources to meet the clients’ specific requirements and the quality of services criteria while adhering to the resource usage policies. Figure 8.1 shows an exemplary relationship of resource providers and consumers for a collaborative Grid computing scenario. Clients or users submit their requests for application execution along with resource requirements from their home domains. A Resource broker selects a domain with appropriate resources to acquire from and to execute the application or route the application to domain for execution with results and status returning to the home domain. IDC1 defined two specific aspects of Clouds: Cloud Services and Cloud Computing. Cloud Services are “consumer and business products, services and solutions that are delivered and consumed in real-time over the Internet” while Cloud Computing is “an emerging IT development, deployment and delivery model, enabling real-time delivery of products, services and solutions over the Internet (i.e., enabling Cloud services)”. Amazon’s Elastic Compute Cloud2 popularized the Cloud computing model by providing an on-demand provisioning of virtualized computational resources as metered services to clients or users. While not restricted, most of the clients are individual users that acquire necessary resources for their own usage through EC2’s APIs without cross organization agreements or contracts. 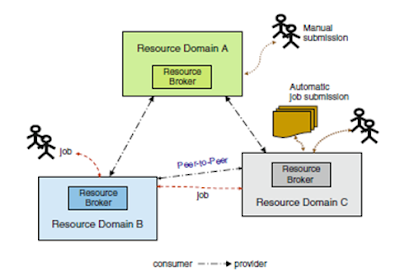 Figure 8.2 illustrates possible usage models from clients C1 and C2 for resources/services of Cloud providers. As Cloud models evolve, many are developing the hybrid Cloud model in which enterprise resource brokers may acquire additional needed resources from external Cloud providers to meet the demands of submitted enterprise workloads (E1) and client work requests (E2). Moreover, the enterprise resource domain and Cloud providers may all belong to one corporation and thus form a private Cloud model. The Grid encompasses two areas of distributed system activity. One is operational with an objective of administrating and managing an interoperable collection of distributed compute resource clusters on which to execute client jobs, typically scientific/ HPC applications. The procedures and protocols required to support clients from complex services built on distributed components that handle job submission, security, machine provisioning, and data staging. The Cloud has similar operational requirements for supporting complex services to provide clients with services on different levels of support such application, platform and infrastructure. The Grid also represents as a coherent entity a collection of compute resources that may be under different administrative domains, such as universities, but inter-operate transparently to form virtual organizations. Although interoperability is not a near term priority, there is a precedent for commercial Clouds to move in this direction similarly to how utilities such as power or communication contract with their competitors to provide overflow capacity. The second aspect of distributed computing in the Grid is that job themselves are distributed, typically running on tightly coupled nodes within a cluster and leveraging middle ware services such as MPICH. Jobs running in the Grid are not typically interactive, and some may be part of more complex services such as e-science work flows. Workloads in Clouds usually consist of more loosely coupled distributed jobs such as map/reduce, and HPC jobs written to minimize internode communication and leverage concurrency provided by large multi-core nodes. Service instances that form components of a larger business process work flow are likely to be deployed in the Cloud. These workload aspects of jobs running in the Cloud or Grid have implications for structuring the services that administer and manage the quality of their execution. This will create an application skeleton for you, complete with everything you need to build your first Android application: Java source code, build instructions, etc. However, you are probably going to need to customize this somewhat. • --target indicates what version of Android you are "targeting" in terms of your build process. You need to supply the ID of a target that is installed on your development machine, one you downloaded via the SDK and A VD Manager. You can find out what targets are available via the android list targets command. T ypically, your build process will target the newest version of Android that you have available. • --path indicates where you want the project files to be generated. Android will create a directory if the one you name does not exist. For example, in the command shown above, a Skeleton/Now/ directory will be created (or used if it exists) underneath the current working directory, and the project files will be stored there. • --activity indicates the Java class name of your first activity for this project. Do not include a package name, and the name has to meet Java class naming conventions. • --package indicates the Java package in which your first activity will be located. This package also uniquely identifies your project on any device on which you install it, and this package also needs to be unique on the Android Market if you plan on distributing your application there. Hence, typically, you construct your package based on a domain name you own (e.g., com.commonsware.android.skeleton), to reduce the odds of an accidental package name collision with somebody else. For your development machine, you will need to pick a suitable target, and you may wish to change the path. The activity and package you can leave alone for now. 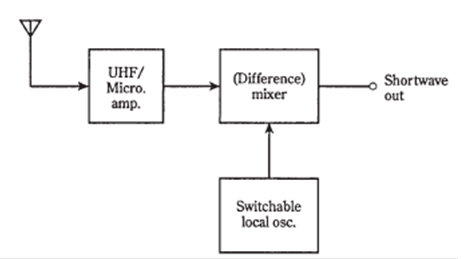 In 1996, the vast majority of domestic amplifiers were two-channel stereo units. Since then there has been a great increase in other formats, particularly in multichannel units having seven or more channels for audio-visual use, and in single-channel amplifiers built into subwoofer loudspeakers. Multichannel amplifi ers come in two kinds. The most cost-effective way to build a multichannel amplifier is to put as many power amplifi er channels as convenient on each PCB, and group them around a large toroidal transformer that provides a common power supply for all of them. While this keeps the costs down there are inevitable compromises on interchannel crosstalk and rejection of the transformer’s stray magnetic fields. The other method is to make each channel (or, in some cases, each pair of channels) into a separate amplifier module with its own transformer, power supply, heat-sinks, and separate input and output connections – a sort of multiple-monobloc format. The modules usually share a microcontroller housekeeping system but nothing else. This form of construction gives much superior interchannel crosstalk, as the various audio circuits need have no connection with each other, and much less trouble with transformer hum as the modules are relatively long and thin so that a row of them can be fitted into a chassis, and thus the mains transformer can be put right at one end and the sensitive input circuitry right at the other. Inevitably this is a more expensive form of construction. Subwoofer amplifi ers are single channel and of high power. There seems to be a general consensus that the quality of subwoofer amplifi ers is less critical than that of other amplifiers, and this has meant that both Class-G and Class-D designs have found homes in subwoofer enclosures. Subwoofer amplifiers differ from others in that they often incorporate their own specialized filtering (typically at 200 Hz) and equalization circuitry. In commercial practice, this is decided for you by the marketing department. Even if you can please yourself, the power output capability needs careful thought as it has a powerful and non-linear effect on the cost. The last statement requires explanation. As the output power increases, a point is reached when single output devices are incapable of sustaining the thermal dissipation, parallel pairs are required, and the price jumps up. Similarly, transformer laminations come in standard sizes, so the trans- former size and cost will also increase in discrete steps. Domestic hi-fi amplifiers usually range from 20Wto 150Winto 8� though with a scattering of much higher powers. PA units will range from 50 W, for foldback purposes (i.e., the sound the musician actually hears, to monitor his/her playing, as opposed to that thrown out forwards by the main PA stacks; also called stage monitoring) to 1kW or more. Amplifiers of extreme high power are not popular, partly because the economies of scale are small, but mainly because it means putting all your eggs in one basket, and a failure becomes disastrous. This is accentuated by the statistically unproven but almost universally held opinion that high-power solid-state amplifiers are inherently less reliable than others. If an amplifier gives a certain output into 8�, it will not give exactly twice as much into 4� loads; in fact it will probably be much less than this, due to the increased resistive losses in 4� operation, and the way that power alters as the square of voltage. Typically, an amplifier giving 180W into 8� might be expected to yield 260W into 4� and 350W into 2�, if it can drive so low a load at all. These figures are approximate, depending very much on power supply design. Nominally 8� loudspeakers are the most common in hi-fi applications. The nominal title accommodates the fact that all loudspeakers, especially multi element types, have marked changes in input impedance with frequency, and are only resistive at a few spot frequencies. Nominal 8� loudspeakers may be expected to drop to at least 6� in some part of the audio spectrum. To allow for this, almost all amplifiers are rated as capable of 4� as well as 8� loads. This takes care of almost any nominal 8� speaker, but leaves no safety margin for nominal 4� designs, which are likely to dip to 3� or less. Extending amplifier capability to deal with lower load impedances for anything other than very short periods has serious cost implications for the power-supply transformer and heatsinking; these already represent the bulk of the cost. The most important thing to remember in specifying output power is that you have to increase it by an awful lot to make the amplifier significantly louder. We do not perceive acoustic power as such – there is no way we could possibly integrate the energy liberated in a room, and it would be a singularly useless thing to perceive if we could. It is much nearer the truth to say that we perceive pressure. It is well known that power in watts must be quadrupled to double sound pressure level (SPL) but this is not the same as doubling subjective loudness; this is measured in Sones rather than dB above threshold, and some psychoacousticians have reported that doubling subjective loudness requires a 10 dB rather than 6 dB rise in SPL, implying that amplifier power must be increased tenfold, rather than merely quadrupled��. It is any rate clear that changing from a 25W to a 30W amplifier will not give an audible increase in level. This does not mean that fractions of a watt are never of interest. They can matter either in pursuit of maximum efficiency for its own sake, or because a design is only just capable of meeting its output specification. Few fields of technical endeavour are more plagued with errors, mis-statements and confusion than audio. In the last 20 years, the rise of controversial and non-rational audio hypotheses, gathered under the title Subjectivism has deepened these difficulties. It is commonplace for hi-fi reviewers to claim that they have perceived subtle audio differences which cannot be related to electrical performance measurements. These claims include the alleged production of a ‘three-dimensional sound-stage and protests that the rhythm of the music has been altered’; these statements are typically produced in isolation, with no attempt made to correlate them to objective test results. The latter in particular appears to be a quite impossible claim. This volume does not address the implementation of Subjectivist notions, but confines itself to the measurable, the rational, and the repeatable. This is not as restrictive as it may appear; there is nothing to prevent you using the methodology presented here to design an amplifier that is technically excellent, and then gilding the lily by using whatever brands of expensive resistor or capacitor are currently fashionable, and doing the internal wiring with cable that costs more per metre than the rest of the unit put together. Such nods to Subjectivist convention are unlikely to damage the real performance; this is however not the case with some of the more damaging hypotheses, such as the claim that negative feedback is inherently harmful. Reduce the feedback factor and you will degrade the real-life operation of almost any design. Such problems arise because audio electronics is a more technically complex subject than it at first appears. It is easy to cobble together some sort of power amplifier that works, and this can give people an altogether exaggerated view of how deeply they understand what they have created. In contrast, no-one is likely to take a ‘subjective’ approach to the design of an aeroplane wing or a rocket engine; the margins for error are rather smaller, and the consequences of malfunction somewhat more serious. The Subjectivist position is of no help to anyone hoping to design a good power amplifier. However, it promises to be with us for some further time yet, and it is appropriate to review it here and show why it need not be considered at the design stage. The marketing stage is of course another matter. 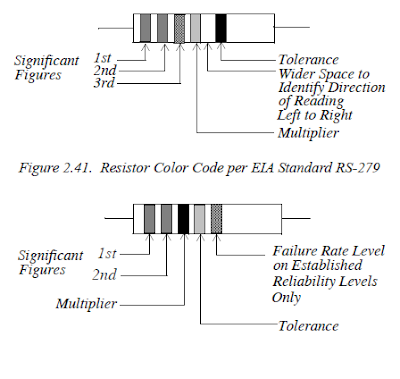 The Resistor Color Code is used for marking and identifying pertinent data for standard resistors. Figures 2.41 and 2.42 show the color coding scheme per EIA Standard RS-279 and MIL-STD- 1285A respectively. 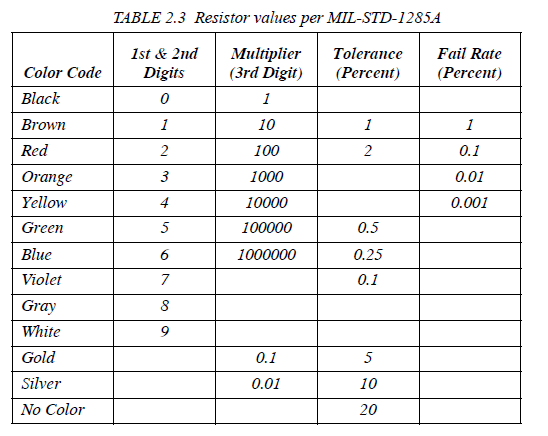 In a color coded scheme, each color represents a single digit number, or conversely, a single digit number can be represented by a particular color band as shown in Table 2.3 that is based on MILSTD- 1285A color code. As shown in Figure 2.42, the first and second bands designate the first and second significant digits respectively, the third represents the multiplier, that is, the number by which the first two digits are multiplied, and the fourth and fifth bands, if they exist, indicate the tolerance and failure rate respectively. The tolerance is the maximum deviation from the specified nominal value and it is given as a percentage. The failure rate is the percent probability of failure in a 1000-hour time interval. Let A and B represent the first and second significant digits and C represent the multiplier. 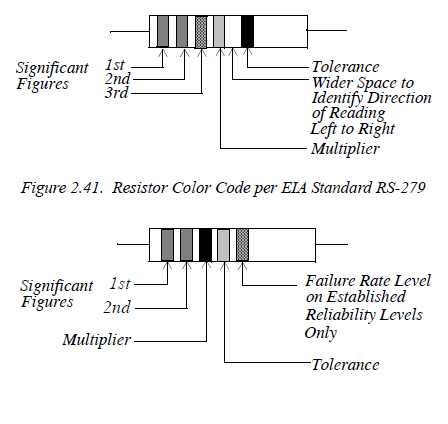 The value of a resistor is coded with the following colored band code, left to right: Brown, Green, Blue, Gold, Red. 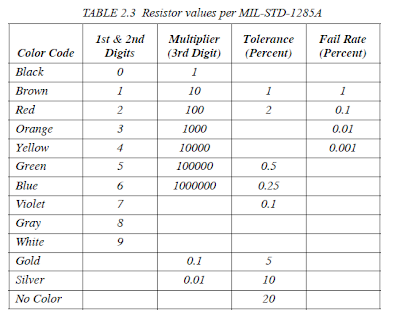 What is the value, tolerance, and probability of failure for that resistor? Table 2.3 yields the following data: Brown (1st significant digit) = 1, Green (2nd significant digit) = 5, and Blue (multiplier) = 1,000,000. Therefore, the nominal value of this resistor is 15,000,000 Ohms or 15 MΩ. The 4th band is Gold indicating a ±5% tolerance meaning that the maximum deviation from the nominal value is 15,000,000 ±5% = 15,000,000 × ±0.05 = ±750,000 Ohms or ±0.75 MΩ. That is, this resistor can have a value anywhere between 14.25 MΩ and 15.75 MΩ. Since the 5th band is Red, there is a 0.1% probability that this resistor will fail after 1000 hours of operation. The H.324 standard is new. It provides a foundation for interoperability and high quality video, voice, and data-based phone calls, and was recently adopted by the ITU. The H.324 standard specifies a common method for simultaneously sharing video, voice, and data over high-speed modem connections. It is the first standard to specify interoperability over a single analog line. This means that the next generation of videophone products will be able to talk to one another and provide a foundation for market growth. The H.324 standard uses a normal 28,800 b/s modem connection between callers. This is the same type of modem connection that is used today to connect PC-users to the Internet and other online services. Once a modem connection has been established, the H.324 standard specifies how digital video and voice compression technologies are used to convert sounds and facial expressions into a digital signal. The H.324 standard defines how these signals are compressed to fit within the data rate allowed by analog phone lines and modem connections. The data rate allowed by modems is up to a maximum of 28,800 b/s. Voice is compressed down to a rate of around 6,000 b/s. The video picture is also compressed, and uses the rest of the bandwidth allowed by the modem connection. ■ Stand-alone videophone – This device will appear like a wall telephone, but with a camera mounted on top and an LCD display. ■ TV-based videophone – This videophone will look like a cable set-top box with a built-in camera and it will sit on top of a television. The TV will be used for displaying a videophone image. ■ PC-Based Videophone – There will also be H.324 videophone software applications for PCs. Software-based videophones will use color monitors to display images, and 28,800 b/s modems to connect to other videophones. Software-based videophones will take advantage of the processor’s performance in compressing and decompressing audio and video signals. There will also be PC-based videophone products available that will run on slower PC’s. These products will be more expensive than software-based videophones. They will use addin boards with advanced digital signal processors (DSPs) to compress audio and video and to perform modem functions. Although video quality is much better than in earlier versions of analog videophone products, H.324 products do not offer “TV” quality. The audio (voice) will sound like a normal phone call, but the video picture will vary depending on screen size. For example, if an image is displayed inside a 176 x 132 pixel window on both ends of a videophone connection, the video picture can be delivered up to 15 frames per second. This rate is roughly half that of the frame rate used for television. But, while the H.324 standard states that videophone products can deliver up to 15 frames per second, the actual frame rate for a videophone will vary depending on the size of the video window selected and the movement of participants during a video phone call. ■ Cordless screenphones – Cordless screenphones provide a complete cordless communication center for the home. These are a combination of cordless telephone, answering machine, address book, message center, and Internet appliance—all in one compact and portable unit. Basically, the cordless screenphone consists of a wireless web pad with color LCD touch screen and built-in cordless speakerphone, plus a small base station. This consumer device is easy to install and use, just as a normal cordless telephone. Installation is as simple as connecting the base station to power and a phone line, and then touching the screen to begin operating the device. Once enabled, you can use it to make phone calls, surf the Web, check your e-mail, and send voice clips—wirelessly. One unusual aspect is that, unlike ordinary cordless phones, it communicates with its base station via Bluetooth or IEEE 802.11b—both are 2.4 GHz short-range spread spectrum digital wireless technology championed by makers of cell phones, PDAs, and other portable devices. Worldwide Internet videophone shipments are expected to reach 3.5 million units by the year 2004, with revenues exceeding $600 million. However, Internet screenphones and videophones are expected to ship 9.5 million units, with $2.2 billion in revenue by the same year. The screenphone business is primarily focused on the average person—especially those who cannot afford, or do not need, all the power of a PC. It also focuses on small to medium-sized companies. This market is not focused on the high-tech user. Screenphones are priced at approximately $240, with a basic monthly service fee of $60 to $70. One of the methods used to sell the screenphone is direct selling (compensation plan), which many people think is a flourishing and beneficial business. Of course, many big telecommunication companies also provide the screenphone. Other businesses involved in this field include device manufacturers, software vendors, network operators, and service providers. ■ Low-end screenphone products (current price range $100–$150) – These use a very small LCD display and provide only the most basic access to limited Internet content such as text e-mail or text news. They usually allow only three to four lines of information on the screen. ■ Midrange screenphones (current price range $199–$399) – Midrange devices have a larger screen with a miniature keyboard. These products provide robust interactivity with limited Web browsing capabilities, through the use of ADSI (Analog Display Services Interface) scripts. Vertical applications such as home banking and information-based service such as stock quotes, news feeds, weather, e-mail, sports scores, and more can be accessed from the Internet. In some cases, a user can create e-mail and browse the Web on a miniature keyboard. The variation in cost is due to features such as digital answering machines, cordless handsets, etc. ■ High-end products (current price range $400+) – These have a 7- to 8-inch color screen with graphics and touch-screen capabilities that allow e-mail, and Web browser (IP) functionality. Other, smaller applications include address books and notepads, as well as support for advanced network services such as caller ID and voicemail. They have a touch-screen, retractable keyboard, and smart card reader. They are intended for quick Web-based transactions such as ordering pizza or downloading stock quotes. They usually include speakerphones and feature two-line capability, allowing for simultaneous Web browsing and voice communications over standard telephone lines. Some of these also include digital answering machines. The first generation of this phone will connect with a 56-Kb/s modem that shares one phone line for Internet and regular phone calls. Future models will be able to handle two lines, as well as ADSL (using phone lines) high-speed connection techniques. The Internet screenphone bears some similarity to other consumer Internet appliances, such as TiVo, that are intended to shield users from some of the complexities of the Internet. TiVo boxes automatically dial into the Internet over a phone line, but, in the future, TiVo plans to achieve high-speed Internet access using cable TV infrastructure. It’s a common experience that audio amplifiers can deliver signals that destroy loudspeakers. High performance domestic systems are the most vulnerable, as abuse ruggedness is not much called for. Alias ‘burning out’. Applies solely to electro-dynamic drivers, including ribbon types. Caused by excess power (energy integrated over time). When cone and compression drive-units are somewhat over-driven, the high temperature-rated adhesive holding the voice-coil wire (or foil) together, melts and deforms. If this causes the coil to rub, there will be distortion, sometimes only at higher drive levels, effectively making the driver unusable. The wire may also fracture from chafing or impact, either at first, or eventually. Or turns can short, changing the driver’s characteristic. These fates are common in bass drivers. If the over-drive is harder, and particularly if its onset is abrupt enough, the glue is burnt to a crisp and the conductor, if copper, may be heated to incandescence, before snapping. Large, unwanted RF signals delivered from amplifiers often have this effect. Either level of thermal failure is most common in HF drive units. Applies to most drive-unit types. This covers ripped cones, diaphragms and surrounds, snapped ‘tinsel’ leadout wires, and fractured voice coil wire or foil. A loudspeaker cone attempts to move further as it is driven harder. It also attempts to move further when it is resonating, and in most enclosures, increasingly further when driven by lower frequencies. Large excursions are a problem especially for compression and hf drivers (if driven down to their low end limit), and bass cone-drivers. If driven some way beyond the maximum linear excursion (Xmax) rating (in mm or inches), damage will ultimately result to the drive-unit, later if not immediately. The excursion this occurs at may be specified as the Xdamage rating (again in mm or inches). For a high power bass drive-unit, Xdamage is typically 300% (3x) Xmax. Mechanical failures can also result from the hugely high-g-forces that hf drivers are subjected to. G-forces in bass drivers can be far less yet they are commensurately stressful, in view of their higher moving mass. Mechanical damage is rare in midrange drivers. ■ Complete communications center – A phone, browser, address book, and message center all-in-one for telephony, Internet access, and email services. ■ Broadband transmission and reception – Full-motion color video and audio transmitted over standard analog telephone lines. ■ Email – Some screenphones provide automated periodic retrieval of email without the need for a PC. ■ Internet connectivity – Screenphones provide the easiest and fastest method (one-button) to surf the Web for information, entertainment, and e-commerce. One does not have to wait for the system to boot-up, and a simple touch on the screenphone’s screen allows you to immediately surf the Internet. Faster connections are possible using both home and office Internet screenphones. With built-in fast cable or ADSL modem, the Internet screenphone provides non-interrupted Internet connection. Along with Internet access, the built-in magnetic strip reader can be used for home shopping, home banking, and bill payment. The on-line banking service allows you to transfer funds, make account inquiries, and find out loan and deposit rates. The 24-hour bill payment services eliminate the need for writing checks and can be done at any time. This makes life simpler and more convenient for many. Internet access could also be used to get the real-time sports updates, horoscopes, lottery results, FedEx tracking, etc. For professional use you could get the live stock quotes, business credit information, investment and stock reports, 24-hour news coverage, etc. ■ Internet phone calls allow call and surf at the same time – Screenphones allow the user to make phone calls, see each other, and perform Internet activities at the same time. This does, however, require two telephone lines—one for telephony and another for Internet connection (or a single phone line and a broadband access connection). This allows the consumer to never miss any important call. ■ Safe and secure transactions – Advanced encryption (SSL) allows you to safeguard sensitive information transmitted through the public Internet. You can enjoy a world of possible applications via SSL that includes home banking, Internet shopping, stock trading, and much more—all at the simple touch of a fingertip. ■ PC-like features – The screenphone includes software like DOS, Windows 3.1, Netscape Navigator, games, word processor, and spreadsheet that allow you to do many basic things that PCs can do. ■ All normal phone features – Screenphones retain all telephone features, such as call waiting, three-way calling, call blocking, call log, caller ID, hands-free speakerphone, and voice mail. Audio amplifier power delivery capability (in watts) has a relationship to cost that is roughly linear, hence £ or $ per watt. But amplifier output capability has a highly non-linear, slack relationship with perceived loudness. Thus the particular power rating can matter surprisingly little (unless you are adept at thinking geometrically or logarithmically), so long as it is in the right area (numerically) and plays loud enough in practice. i) the sensitivity (or efficiency) of the speaker system. Sensitivity is usually cited for 1 watt of drive, at 1 metre distance. The 1 watt is alternatively (and preferably) specified as 2.38v rms (the voltage for 1w⇒8Ω) into any impedance. Sound level drops off at between 3dB and 6dB per each doubling in this distance, depending on speaker directivity and the acoustic conditions. ii) the maximum SPL required. For some kinds of music and situation, 105dB will do; for others, 140dBSPL will be required. iii) the room size. How many metres distance are the above SPLs required at? If the room is at all big, then unless the listening position is near to the speakers relative to the room size, room acoustic data, such as reverberation time, will be involved. iv) the headroom required. Like a car with a larger than normal engine, an oversized amplifier won’t easily be stressed, and sonics can benefit accordingly. Pro audio systems routinely employ amplifiers rated at five to even ten times the longterm ‘AES/EIA’ rating of the speakers they are used with. For domestic hi-fi, home cinema, and recording studio control rooms, there are usually few listeners, often 1 or 2 and perhaps 10 at most. Here, room size is the key factor. In small rooms, listeners are typically only 2 to 4m distant. In large rooms, distance ranges 4m to 12m at most. Domestic speaker sensitivities average 87dB @ 1w @ 1m but range from below 80 up to 97dB @ 1w @ 1m. Maximum SPLs are usually satisfactory if between 100 to 120dB (C-wtd, peak) at 1m. There are already a range of variables, without mentioning the many other factors. In practice, power requirements are never calculated from first principles by users. Instead, rules of thumb and experience give figures which are near enough most of the time. -with ordinary speakers and commonly acceptable sound levels – 30 watts to 300w. Go higher for bigger rooms and/or higher levels. -with horn-loaded speakers, 0.3w to 10 watts, and upwards to 1kW if the neighbours can handle it, else as above. For studio nearfield monitoring 50 to 500 watts overall; or 30 to 300w per band if active. For main studio monitoring 250w up to 2kW per frequency band. - in any indoor space, allow between 1 watt and 15 watts per person, with more watts per person for fewer people, and less for more. - in any outdoor space, allow 2 to 15 watts per person for a large sound system. The increase in the minimum wattage mainly affects large gatherings, and insures against the effects of wind and humidity on sound propagation. When taking a domestic system outdoors, Martin Colloms suggests that with the aid of a substantial wall, four times the indoor power would be needed, and considerably more in a fully open space. Naturally, the power decided upon has to be close to what’s available from the power amplifier, into the nominal impedance of the speakers it is to be used with. 1. A monoblock or single channel amplifier. Users are mostly audiophiles who require physical independence as well as implicit electrical isolation (cf.3); or else musicians needing clean, ‘mono’ instrument amplification. 2a. A stereo or two channel unit.This is the almost universal configuration. In domestic, recording studio ‘nearfield’ and home studio monitoring use, the application is stereo. For professional studios, and for PA, the two channels may be handling different frequency bands, or the same bands for other speakers, but usually it is the same ‘stereo channel’, as amplifiers are normally behind, over or underneath the L, R or centre speaker cabs they are driving. 2b. Dual monoblock – as 2 but the two channels are electrically separated and isolated from each other – the intention being so they can handle vastly different signals without risk of mutual interference. However, being in proximity in a single enclosure and possibly employing a common mains cable, together with having unbalanced inputs, inevitably allows some form of crosstalk through voltage-drop superimposition; and magnetic and/or electrostatic coupling and interaction, between wiring. 3. Multi-channel – most often 3,4 or 6 channels. Originally for professional touring use, for compactness, eventually working within the constraints of the 19" wide ‘rack-mount’ casing system, the de-facto amplifier casing standard for pro audio gear worldwide. Three and six channel mono and stereo ‘Tri-amp’ units have been made so the three frequency bands needed to drive many actively configured PA speakers, can come from a single amplifier box. Multichannel power amps are also applicable to home cinema and home or other installed Ambisonic (higher-dimensional) systems. 4. Integrated power-amp + preamp. Not to be confused with monolithic integrated circuits (ICs), this is the familiar, conventional, budget domestic Hi-Fi ‘amp’. The control functions are built in, saving the cost of a separate pre-amplifier in another box. 5. ‘Powered’. The power amp(s) is/are built into the speaker cabinet, to form a ‘Powered’ or ‘Active cabinet’. This approach has been slow to catch on. It has seen some niche use in the past 20 years in smaller installations, and in the home, usually in conjunction with an ‘on-board’ active crossover. One downside, at least for touring, is that even if there is an overall weight reduction, the speaker cabinets assume added weight, which may cause flying (hanging) restrictions. There’s the need to runs mains cables as well as signal cables to each speaker cabinet. This is more of a nuisance in large systems. For touring sound, health and safety legislation is also unwelcoming to powered cabs, particularly when flown, on several counts. Also, if flown, maintenance can be onerous and adjustment impossible without remote control. Although beyond the remit of this book, it is worth noting that musician’s ‘combo’ amplifiers are an older, simpler and far more widespread variant of the powered cab. WHY ARE POWER AMPLIFIERS NEEDED FOR AUDIO?